Syn. : Opegrapha varia Pers., O. diaphora (Ach.) 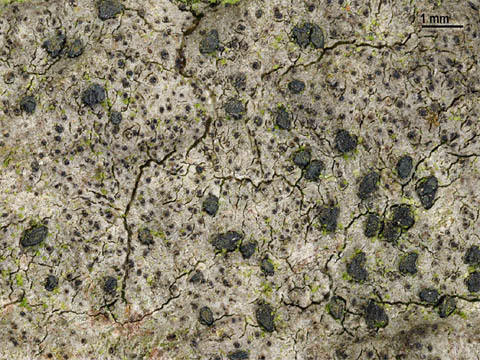 Ach., O. lichenoides Pers., O. pulicaris auct., non Pers. :Fr., incl. O. diaphora var. chlorina (Pers.) Schaer. and var. signata Ach. Corticolous on various trees (especially Acer, Fraxinus, Quercus and Ulmus), in forests and on isolated trees. Belgium: Mar. : R, Fl. : RR, Brab. : RRR, Mosan: AR, Ard. : R, Lorr. : RRR. Luxembourg: Ard. : RR, Lorr. : AR. France: Mar. : RR, Boul. : R, Pic. : RR, Lorr. : RR. Lit. : Boul. : 71, Di: 175-176, 179-180, Ho: 167, 169, 595, NL84: 16, NL92: 172, NL97: 25-26, 52.